This is the second article about High Yield Bond Funds. 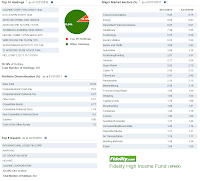 The top funds include Fidelity High Income, T Rowe Price High Yield, Goldman Sachs High Yield A, etc. More fund review can be found in MEPB Financial. To be ahead in interest yield hike, investor can invest in high yield bond especially high yield bond mutual fund. While this type of bond is riskier, this investment can be rewarding. Most of the high yield bonds have a low average duration (less than 5 years). This means the price movement of the bond is limited when the interest rate is raised by federal government. 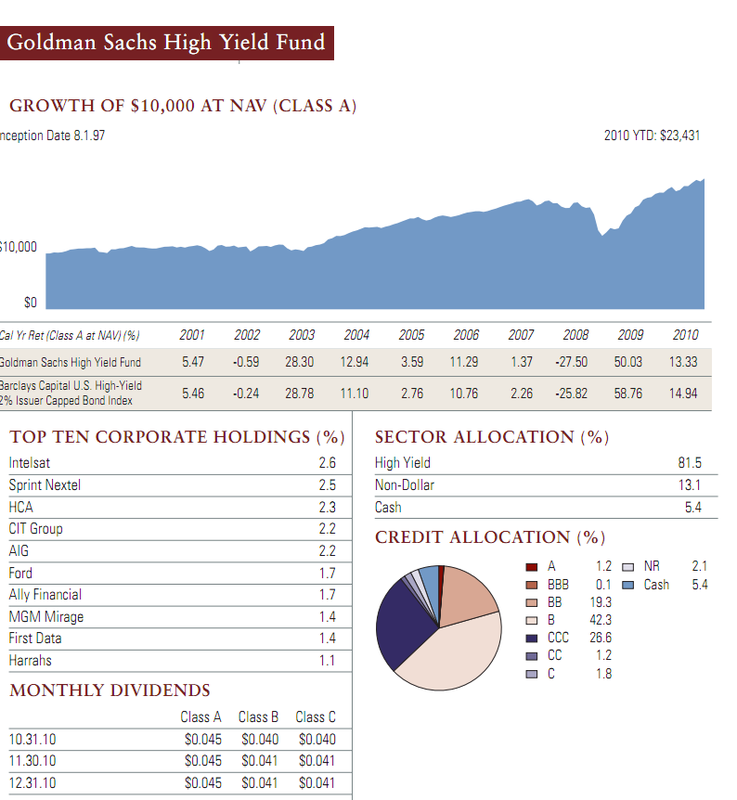 The following is my part 2 article about Top 10 High Yield Bond Funds of 2011. 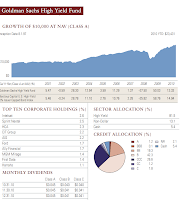 If you miss my first article, you can check it here, Top 10 High Yield Bond Fund Part 1. 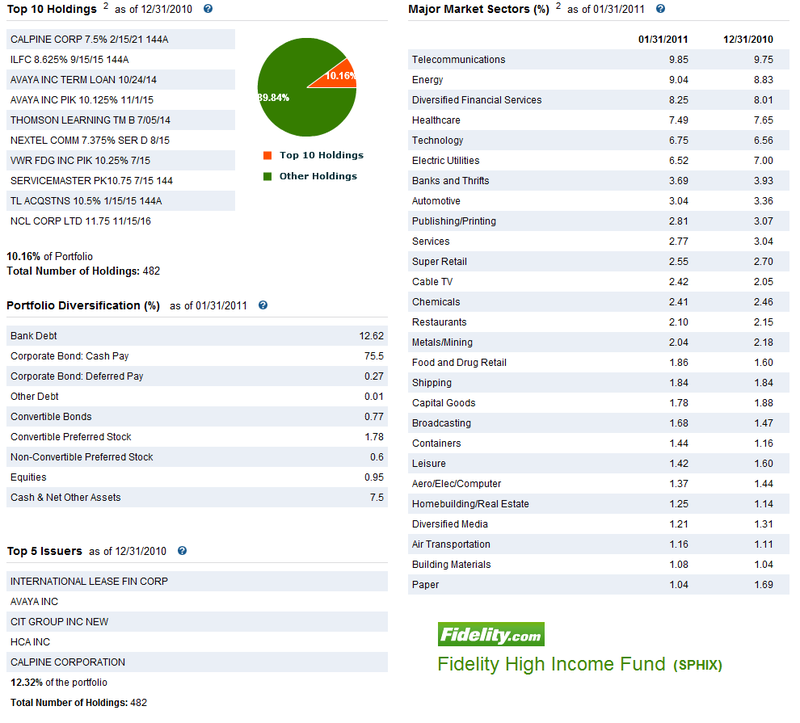 Fidelity High Income fund is the second Fidelity fund in this top 10 high yield fund list. The Fidelity High Income fund objective is to provide high current income and capital growth by investing in income-producing debt securities, preferred stocks and convertible securities, especially in lower quality debt obligations. The fund may invest in either domestic or foreign securities. It potentially invests in non-income producing securities like defaulted securities, common stocks, and companies in troubled or uncertain financial condition. Fred Hoff is the lead fund's manager since 2000. Investor needs an initial investment of $2,500 to buy this fund in brokerage account or IRA. The annual expense ratio is 0.75%. This fund doesn’t have any 12b1 fee and front end sales load fee. It is offered by 66 brokerages. The easiest way to invest in any Fidelity fund is by opening Fidelity brokerage account. As of March 2011, the fund’s yield is 6.92% per year. It also has a 4 stars rating from Morningstar. The fund has returned 16.60% over the past year and 8.60% over the past five year. If you invested $10,000 in this fund ten years ago, you would have $18,462 at present time. Top 6 major market sectors are telecommunications, energy, diversified financial services, healthcare, technology, and electric utilities. Top 10 debt holdings are Calpine Corp, ILFC, Avaya Inc, Thomson Learning TM, Nextel Communication, VWR FDG Inc PIK, Servicemaster, TL acquisition, and NCL Corp Ltd. There are 482 bond holdings. The debt portfolio diversifications include corporate bond (76%), bank debt (13%), cash (7.5%), and convertible preferred stock. 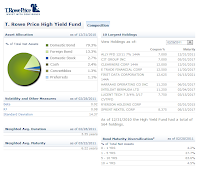 T. Rowe Price High-Yield fund investment seeks high current income and appreciation of capital. The fund usually invests >80% of assets in a diversified portfolio of high-yield corporate bonds, convertible securities, and preferred stocks. This high yield bonds usually consist of a lower rated below investment grade (BB and lower) debts. Its weighted average maturity is in 5 to 10 year range. The fund may invest in futures, swaps, and options. 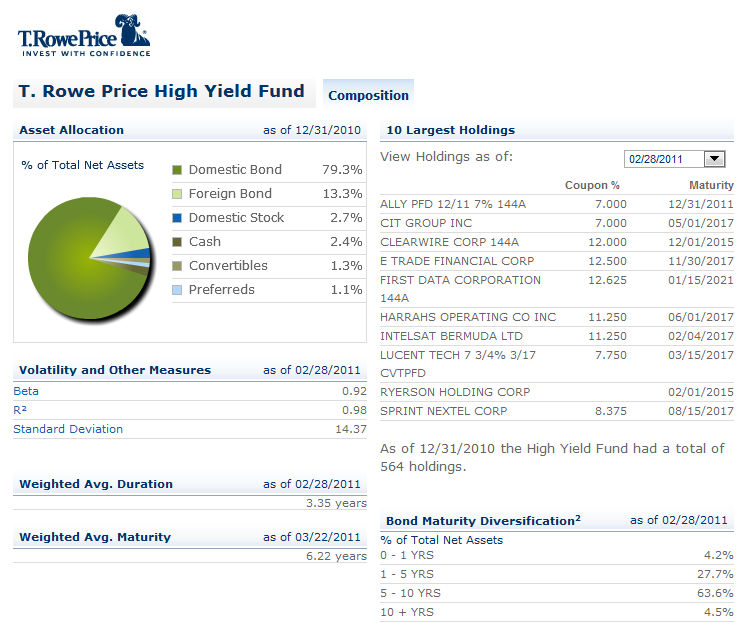 This T. Rowe Price High-Yield fund is managed by Mark J. Vaselkiv, a vice president of T. Rowe Price Group Inc. The fund distribution rate is 7.49% per year. The fund expense ratio is 0.76% per year. You won’t find any 12b1 fee or any sales load in this fund. Its total net asset is $8.54 billion. As of March 2011, the fund has returned 11.51% over the past three year and 7.98% over the past decade. For 2009, the fund annual return is 49.16%. The top 10 largest holdings are Ally preferred, CIT Group Inc, Clearwire Corp, E*Trade Financial Corp, First Data Corporation, Harrahs Operating Co Inc, Intelsat Bermuda Ltd, Lucent Tech, Ryerson Holding Corp, and Sprint Nextel Corp. The fund asset is allocated as follow domestic bond (79.3%), foreign bond (13.3%), domestic stock (2.7%), cash (2.4%), convertibles (1.3%), and preferreds (1.1%). The fund weighted average duration is 3.35 years. The fund weighted average maturity is 6.22 years. MainStay High Yield Corporate Bond fund objective is to provide current income and capital appreciation. The majority of fund asset (>80%) is invested in high-yield corporate debt securities (domestic and foreign corporate debts). These funds are rated by major rating agencies such as Moody's or Standard & Poor's ("S&P"). It may invest some of its asset (<20%) in common stocks and other equities. The fund also has an annual expense ratio of 1.03%. It also has 0.25% 12b1 fee and 4.50% front end sales load fee. The fund lead manager is J. Matthew Philo. This MainStay fund also pays a yield of 7.04%. This yield is distributed monthly. The fund has returned 8.66% over the past year and 5.97% over the past 5 year. Regular investor may also invest variety of classes for this fund. The other classes include MKHCX (class B), MYHCX (class C), MHHIX (investor class), MHYIX (class I), and MHYRX (Class R2). These classes may offer lower fees. You may have accessed through your IRA account, 401k account or some other brokerage accounts. As January 2011, the fund effective maturity is 5.9 years and the fund effective duration is 3.4 years. The annual turnover rate is 41%. There are 493 holdings in this fund. The total net asset is $6.6 billion. The fund top sectors are consumer non cyclical, consumer cyclical, communications, energy, and financials. Top 5 corporate bond holdings include RRI Energy Inc, Intelsat Subsidiary Holding Co Ltd, Calpine Construction Finance Co and CCFC Finance Corp, Charter Communications operating llc or Charter Communications Capital Corp, and Crum & Forster Holdings Corp.
Goldman Sachs High Yield investment seeks current income as well as appreciation of capital. The fund normally invests >80% of net assets in high-yield which are non investment grade fixed income securities. It may invest <25% of total assets in obligations of domestic and foreign issuers which are denominated in currencies other than the U.S. dollar and in securities of issuers located in emerging countries denominated in any currency. The fund invests up to 20% of net assets in investment grade fixed income securities such as the US government, its agencies, instrumentalities or sponsored enterprises debts. Since 2004, Robert Cignarella has been the lead manager of this fund. This Goldman Sachs fund can be purchased from 122 brokerages like Pershing FundCenter, Schwab Institutional Load Waived, Wells Fargo, Firstrade, etc. The fund distribution rate is 7.25% per year. This yield is distributed monthly. The fund annual expense ratio is 1.05% per year. There is also 0.25% 12b1 fee and 4.25% front end sales load fee. The current total net asset of this fund is $6 billion. The minimum investment is $1,000 for brokerage account and $250 for IRA. As of March 2011, the fund has returned 8.43% over the past three year and 5.93% over the past five year based on load adjusted returns. The option adjusted duration of this fund is 3.57 years. This Goldman Sachs fund also consists of 769 bonds. The top 10 corporate holdings include Intelsat, Sprint Nextel, HCA, CIT Group, AIG, Ford, Ally Financial, MGM Mirage, First Data, and Harrahs. Top 3 bond sectors are high yield bond (81.5%), non dollar bond (13.1%), and cash (5.4%). The investment in Northern High Yield Fixed Income is pursuing for current income. The major net assets investment of this fund (>80%) is in lower quality bonds and other fixed-income securities. During certain temporary period, this fund may also invest all of its assets in higher quality securities for defensive reason. Although the main investment is in domestic issuers but it may also invest in foreign issuers in small amount. Richard J. Inzunza has managed this fund since 2007. Besides being the fund manager, he is as well the Vice President at The Northern Trust Company. This fund can be purchased from 82 brokerages include T. Rowe Price, Fidelity Institutional FundsNetwork, Schwab Retail and TD Ameritrade, Inc. The fund distribution rate is 7.25% per year. The expense ratio of this fund is 0.89% annually which is quite low compared to the average (1.18%). There is no 12b1 fee as well as no sales load. The minimum balance to invest in this fund is $2,500 for brokerage account and $500 for IRA account. As of January 2011, this Northern fund total net asset is $3.7 billion. It consists of 192 debt holdings. The average duration is 4.6 years and the average maturity is 8.1 years. Top 10 sector weightings include consumer cyclical (20.4%), communications (15.2%), consumer non cyclical (11.8%), financial institutions (11.4%), utilities (8.0%), energy (7.5%), capital goods (6.0%), technology (5.0%), basic industry (4.5%), and short term fund (4.2%). Top 10 bond holdings are Intelstat Bermuda, CIT Group, Gmac Inc, Ford Motor Credit Co Llc, Energy Future Holdings Corp, HCA Inc, AES Corp, White Mountains RE Group Preferred shares, US Foodservice Inc, and Qwest Cap.